When you're choosing plants to create pretty borders in your garden, take into account the architectural style of your home and garden, as well as the colours used in the building materials of the house, paths, steps, walls and fences. Consider, too, the quality of light throughout the day in different areas and through the seasons. Strong colours work well in bright sunlight whereas pale shades can appear bleached out; pastels look their best in morning light and whites at dusk. Follow our tips to choose the best colour scheme for your garden. Then follow more practical tips on how to design a garden from scratch. For gardeners, the colour wheel, with half composed of hot or warm colours and the other half with cold or cool colours, is useful to demonstrate the differences between harmonies and contrasts. Bright colours add drama and bring the area into the foreground. Hot colours work best in sunny gardens, and as they appear closer they make a garden feel more intimate. Calming, cool colours recede and blur the boundaries so can be used effectively to make an area feel bigger. Harmonious colours are close to each other on the wheel while contrasting, yet often complementary colours, are found on the opposite sides and can intensify an effect – for example, red flowers look brighter against a green background. Merely take a look at nature’s partners, such as the striking dark leaf foliage of the orange Dahlia ‘David Howard’ for ideas for combinations. When you look closely at plants you discover that there is colour in all their elements – petals, anthers, leaves, stems, bark, seedheads and berries. You might link the foliage of one plant to the petal of another. By treating the plants in your garden as you would paints on an artist’s palette, you can combine and interweave your own personal canvas. Don’t feel bound to follow rules, however; let your creativity flow. When grouping plants do, however, keep in mind their horticultural compatibility – whether they need similar conditions and will flower at the same time. Want to continue experimenting with colour? Find out how to use a colour wheel for interior design. Consider if you want a signature colour theme year round, or one that changes with the seasons in different areas. Green: The colour of nature, green is calm and soothing. It acts as a foil or background to other hues, or can be used as the main theme. A landscape design of various shades of green, emphasising tone, shape and texture, can be subtle and beautiful. Our eyes are able to detect more nuances in greens than in any other colour and nature gives us a multitude to play with. Whites: A restrained palette of neutral whites against lush greens is timeless, serene and sophisticated, with a freshness and purity that is hard to achieve with other monochrome schemes. Luminous, pale blooms add light to shadowed areas; many are highly scented and work well when combined with stunning foliage in varying tones of greens to silver. A tip to make sure there is interest in the simplicity of a white garden is to include a mix of heights, sizes, textures and flower shapes. Blue: True blue is a rarity in the plant world but it’s worth hunting out these elusive jewels to add a touch of cooling elegance to the garden. Most flowers described as blue are actually shades of violet or purple, but there are some that are pure blues – you often need to take a look in person rather than rely on catalogues or online pictures. Blue extends the view as it recedes, so plant at the end of a border to make it appear longer. 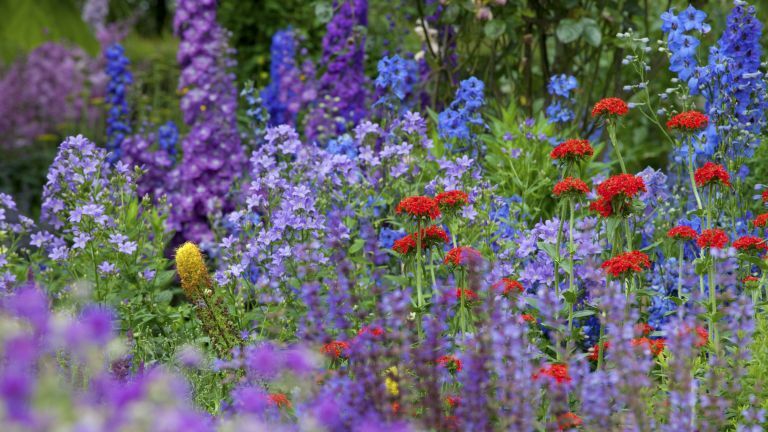 For the real thing some of the most stunning choices include stately delphiniums, iridescent salvias, massed agapanthus and voluptuous hydrangeas. For a fresh, clean combination that gives a sense of distance, echo delft china with blue and white blooms. Add some grey foliage to complete the effect. Blue will stand out against other colours but take care with mixing blue-mauve tones with clear blue as it will throw off the colour; better to put blue with definite purple, mauve and pink for a pretty and harmonious combination. Colour opposites orange and blue make a complementary combination that is sure to stand out, and hot reds and yellow will jump out against cool blues. Pink: Pretty pink offers up possibilities in a wide palette of hues, ranging from deep magenta to the palest shades. Cool pinks have a hint of blue; warm a hint of yellow, and pink can be used boldly or subtly. You can choose to be monochromatic with varying shades of pink to lift a space. The colour is perfect in romantic cottage gardens, mixed with pastels or blues and mauves, or if you’re feeling brave go for a surprising eye-popping combination pairing scarlet pink with orange. Find out how to create a cottage garden in our guide. Hot colours provide energy and warmth. Red: Reds are passionate and add strong focus to an area. They work well with opulent purples or their complementary greens. The tonal range of reds in nature is vast – from the young foliage of roses and berberis foliage, through to clear red poppies or claret and burgundy toned heucheras. Orange: Orange is a colour that more than any other elicits a strong response from the viewer - maligned by some as too garish, and loved by others for the vibrant energy it brings to a space. Think of kniphofias (hot pokers) adding life to a sea of parchment grasses. Orange is seeing a renaissance in the garden. The strongest hues work strikingly set against complementary rich blues and purples, or its softer apricot tones combined with gentle mauves are more subtle. Try orange in seating areas as it stimulates sociability and conversation. Yellow: Yellow adds bursts of sunlight to a scheme. Cheerful yellow can work well in golden borders, mixed with oranges and bronzes, or contrasted with blues or purples it really draws the eye. It can be bright and vivacious or toned down to creams, which blend with most colour groupings. Keep your design simple as yellow has lots of impact and consider the angles of light and the glorious transparent effect of backlighting yellow for a radiant glow, especially when the sunlight is low in early spring and autumn. Consider, too, the possibilities of painted seating, pots and features adding to your colour canvas. Find inspiration in our guide to container gardening. Rudbeckias create blocks of golden daisy-like blooms from summer through autumn. These hardy perennials need a sunny position in average to rich soil that is well-drained. Red and orange varieties are also available and perfect companions include heleniums, asters, grasses, verbena and salvias. Achilleas like a sunny spot in moist, well-drained soil. They work well in summer to autumn schemes mixed with choices such as salvias, eryngium and grasses. Varieties are available in terracotta, yellow, red, pink and white. Kniphofias or red hot pokers are striking perennials that bring colour over many months. Grow in average to humus-rich, well-drained soil in full sun. Once established are drought tolerant. Crocosmias add flaming colour in the summer and late-season garden. Plant the corms in well-drained humus-rich soil in a sunny position. Drought tolerant and easy care, will form clumps and work well in informal planting schemes with asters, heleniums, grasses, or for impact contrasting purples from aconitum, salvias and nepeta. Dahlias offer a plethora of choices, from single vibrant dahlias with dark foliage to dinner-plate show stoppers, abundant in bloom from summer to late autumn. Provide them with well-drained soil and plenty of sunshine. Lift the tubers or mulch the ground over winter. Hollyhocks are short-lived perennials. Grow in sun to part shade in humus-rich, well-drained soil. Mix them with other cottage garden favourites. Echinacea is an easy to grow, hardy perennial with a variety of colours, including pink, yellow, green and white. They need full sun in fertile, well-drained soil. Mix in harmonious blocks or with grasses in a prairie style. Irises offer myriad iridescent colours and combinations with around 300 varieties. Bearded irises like a sunny spot with well-drained soil and work well with choices such as lupins, foxgloves, salvias, alliums, roses, nigella and phlox. Delphiniums these stately spires come in glorious shades of pink, mauve, purple and blue, as well as white. Need rich, moist soils in a sheltered spot. Meconopsis, the blue Himalalyan poppy, is one if you are up for a challenge. They need a mild to warm summer with cool nights and moist, cold winter, with cool, damp, neutral to acid, humus-rich soil in part shade, sheltered from winds. Make a striking sight mixed with red or orange erysimum. Hydrangeas offer pink, blue and white flowers to the late-summer and autumn garden. Grow in well-drained, moist soil in sun to part shade. Romneya produce large papery white poppy flowers from summer to autumn. Plant in full sun in fertile well-drained soil with shelter from cold winds. Be aware they can spread once established.